Below are three long-term charts, from Doug Short’s blog post of November 30 titled “ECRI Weekly Update: Beating the Recession Drum.” These charts are on a weekly basis through the November 30 release, indicating data through November 23, 2012. 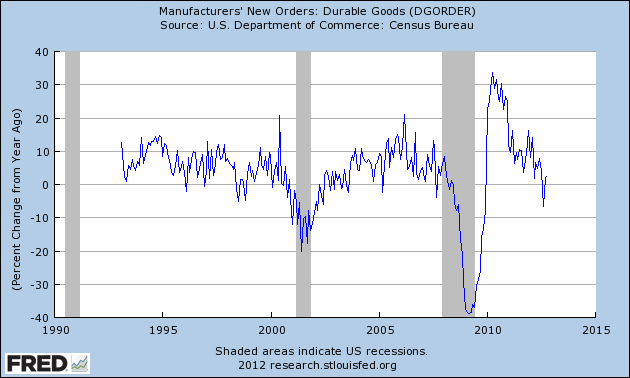 This entry was posted in Economic Forecasts and tagged ECRI on November 30, 2012 by Ted Kavadas. This entry was posted in Economic Forecasts and tagged Economic Forecasts, economic indicators, STLFSI on November 30, 2012 by Ted Kavadas. This entry was posted in Uncategorized and tagged economic indicators on November 29, 2012 by Ted Kavadas. The current levels of each are notable, as they are flagging from a short-term perspective and their long-term trends continue to sink. Doug Short, in his blog post of November 26, titled “The Philly Fed Business Conditions Index” displays both the CFNAI MA-3 (3 month Moving Average) and ADS Index (91-Day Moving Average) from a couple of perspectives. Of particular note, two of the charts, shown below, denote where the current levels of each reading is relative to the beginning of past recessionary periods. 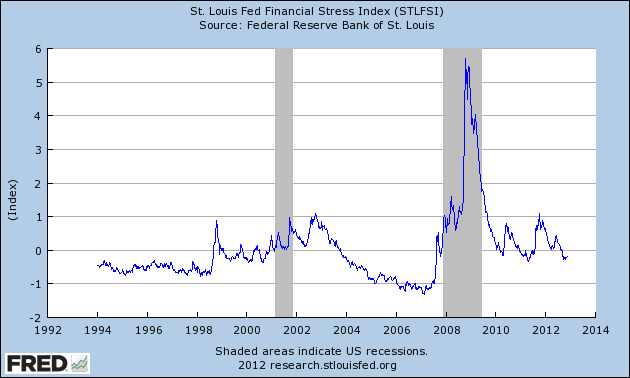 This entry was posted in Uncategorized and tagged economic indicators on November 28, 2012 by Ted Kavadas. As of 11/23/12 (incorporating data through 11/16/12) the WLI was at 125.7 and the WLI, Gr. was at 3.8%. As per the November 21 release, the LEI was at 96.0 and the CEI was at 104.8 in October. This entry was posted in Economic Forecasts and tagged ADS Index, Aruoba-Diebold-Scotti Business Conditions Index, Chicago Fed National Activity Index, Conference Board CEI, Conference Board LEI, economic forecasting, economic indicators, ECRI on November 26, 2012 by Ted Kavadas. Using estimates derived from Treasury Inflation-Protected Securities (TIPS) markets, described in a technical appendix, this weekly report provides two measures of the probability of consumer price index (CPI) deflation through 2017. A chart shows the trends of the two probabilities. As one can see in the chart, the readings are volatile. Prices of Treasury Inflation-Protected Securities (TIPS) with similar maturity dates can be used to measure probabilities of a net decline in the consumer price index over the five-year period starting in early 2011 or the five-year period starting in early 2012. One measure of the probability of deflation for the 2012–17 period rose from 9 percent on November 14 to 11 percent on November 20. 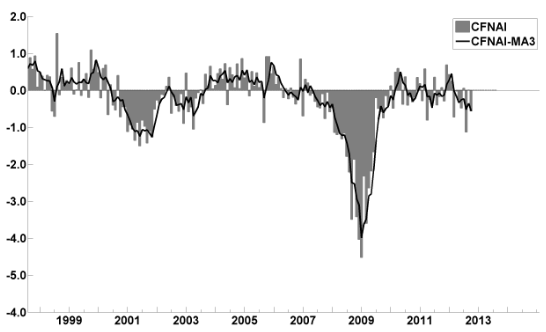 The deflation probability for the 2011–16 period ticked up from 9 percent on November 14 to 10 percent on November 20. I plan on providing updates to this measure on a regular interval. 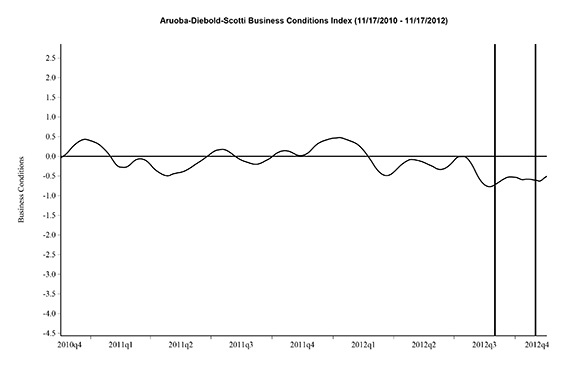 This entry was posted in Economic Forecasts and tagged economic indicators on November 26, 2012 by Ted Kavadas. Below are three long-term charts, from Doug Short’s blog post of November 23 titled “ECRI Weekly Leading Index: Index Rises, Growth Diminishes.” These charts are on a weekly basis through the November 23 release, indicating data through November 16, 2012. 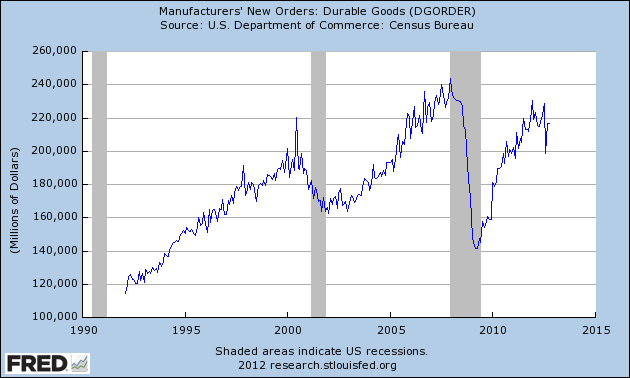 This entry was posted in Economic Forecasts and tagged ECRI on November 23, 2012 by Ted Kavadas. This entry was posted in Economic Forecasts and tagged Economic Forecasts, economic indicators, STLFSI on November 23, 2012 by Ted Kavadas. With regard to our current economic situation, my thoughts can best be described/summarized by the posts found under the 18 “Building Financial Danger” posts. My thoughts concerning our ongoing economic situation – with future implications – can be seen on the page titled “A Special Note On Our Economic Situation,” which has been listed on every blog post since August 15, 2010. This entry was posted in Uncategorized and tagged current economic situation on November 21, 2012 by Ted Kavadas.